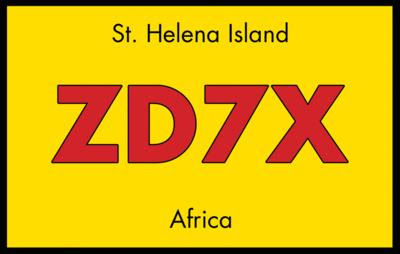 Today I managed a nice QSO with Tom ZD7X who is located at St. Helena which is quite a distance away from my location. 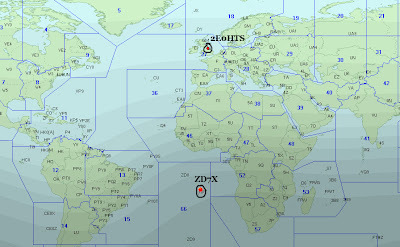 I managed to work Tom ZD7X with a 5/9 report operating my FT-767GX with my home brew 20m delta loop assisted with the MFJ-969 to tune the antenna with 50 watts on 12 meters. 12M is rarely open and I have only had a few QSOs on this band so I guess the new Cycle has begun at last! This information is courtesy of QRZ.Com, I thought Id share it with everyone especially those who might of missed it! QRZ.Com for those of you that don't know it is well worth a look. The European Space Agency (ESA) reports that the SOHO solar observation spacecraft witnessed the start of the new solar cycle. The appearance of a very special solar spot on the sun surface a few days ago, signalled to scientists around the world that a new solar cycle had begun. This solar spot also produced two solar blasts. Each solar cycle lasts an average of 11.1 years. The new solar cycle, called ‘Cycle 24’, started on 4 January this year, when SOHO observed an event scientists have been anticipating for about a year. surface of the Sun. This sunspot convinced scientists that a new solar cycle had begun. Later that day, this finding was made official when the sunspot was catalogued by the US National Oceanic and Atmospheric Administration (NOAA). SOHO was not only first in spotting this harbinger of the new solar cycle, it also observed two associated ‘EIT waves’, blast waves that spread out from active regions on the Sun like ripples from a pebble dropped into water. The new cycle started with a ‘bang’! This is just the beginning, and scientists are now eagerly awaiting the activity to follow. Solar Cycle 24 is expected to build gradually, with the number of sunspots and solar storms reaching a maximum by 2011 or 2012, although intense solar activity can occur at any time. The Solar and Heliospheric Observatory (SOHO) celebrated the twelfth anniversary of its launch on 2 December 2007. The satellite has witnessed the Sun change through almost a complete solar cycle, from quiet to stormy, and back. SOHO is a project of international collaboration between ESA and NASA. The final few weeks of 2007 did not seem to bring any good propagation making DX openings few and far between. I was fortunate to work just one distant station during the festive season on the 27th of December, and using eQSL.cc I sent and gratefully received an eQSL card confirming QSO with ZP5MAL (Juan from Paraguay). This QSO was on the Yaesu FT-767GX with the hustler 6BTV operating on 20M exchanging 5/3 reports. The Ft-767GX has also been working well for me on 7.038 mhz with the aid of my P.C and nomic rig blaster as I have had many successful QSOs using winPSK31se digital mode. The 40m band has been fairly flat for phone contacts just like 80m and 20m for most of the time. Most of my radio talk time has been taking place on 2m running the FT-847 & FT-857. A distinctive increase of activity has been happening on 2m lately which has been welcomed locally. This is probably down to the many new recently licenced operators that have come into the hobby over the last month. Another influencing factor is the poor HF band conditions after the sun has gone down which is about 15.45 utc over here. This and of course the festive season has had a lively effect on 2m which has been very enjoyable. Welcome to all new Hams hope to work you all! The picture above shows information on the high and lows of the solar cycle. which for us radio hams that like to work DX, is a very important issue, thankfully 2007 was at the bottom of the solar cycle and was also the start of the upward sweep. Hopefully solar activity will increase and the band conditions will improve during this new year. I have been fortunate to have been around long enough to have experienced good propagation. This year should bring some new Countries, prefixes and QSL cards to many stations and lets face it conditions can only improve as we have past the worst of the bands poor conditions in the last cycle! I sure am looking forward to hearing some big signals. 73 and good DX. de 2E0HTS Simon, Yorkshire, North England.